Tomorrow Is Near But Today Is Here is a wonderful story with subtle advice hidden in the lines. Author Asaf Rozanes uses rhyming verse to point out all the things Mia is missing by worrying too much. Her dad tries to provide alternatives for her to think about rather than worry. He suggests focusing on today, rather than worry about what might—or might not—happen. Read, draw, play are some suggestions that he provides to keep her mind off things that have not happened. Readers can follow Mia to the park, school trips, and bedtime stories. Full-color illustrations dominate the pages. The artwork is well drawn and draws young readers into this book. Tomorrow Is Near But Today Is Here: Anxiety, ADHD and Anger Managed through Mindfulness is a children’s picture book that may help children who experience anxiety or worry often. Written and illustrated by Asaf Rozanes, this book provides lots of advice for children who may be hesitant or anxious. This book would be a wonderful addition to school and public libraries, as well as homes. There are several pages of activities at the back of the book. At the end of the story, you discover that there is a hidden heart in some of the illustrations. Children love to go back and look at the pictures for the subtle heart shape—it’s a way to get children to look at the book again. The coloring pages are a wonderful idea, especially for teachers or parents who may want to share the story and activities with their students. Tomorrow Is Near But Today Is Here: Anxiety, ADHD and Anger Managed through Mindfulness is a social issues picture book for children aged 3 to 8 years written by Asaf Rozanes. Mia is a lot like most other girls and boys. She likes to have fun and is kind, but sometimes she gets lost in thought. She begins to worry about things, and she loses out on what’s actually happening around her. Sometimes, she misses out on a beautiful sunny day or a game with friends. Other times, she misses out on crazy, exciting things, like a lion escaping from the zoo or a horde of butterflies circling around her. Mia’s dad understood that she sometimes felt like she couldn’t help but get lost in her thoughts and worries, but he had a few simple tricks to show her. Those tricks could help her start enjoying her todays, and they could do it right away. 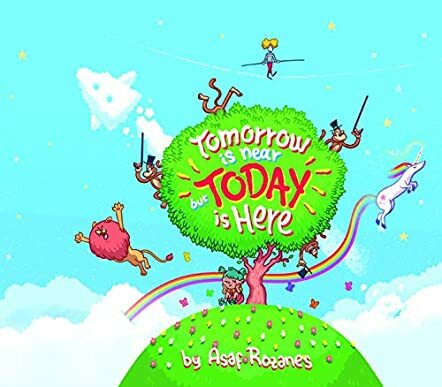 Asaf Rozanes’ Tomorrow Is Near But Today Is Here is a fun and imaginative story geared toward helping kids control the internal dialogue and distraction, and enjoy their daily lives. I loved the whimsical story line and the marvelous illustrations which make Mia’s plight so real. This book can be an excellent starting point for discussions about worrying and how kids can change their outlook on life. Caregivers can point to the progression in the story that shows Mia as apart from all the activity at first. Then, as she practices the tips her dad gives her, she’s seen participating in those activities instead. The breathing exercise given is great for practicing during story time as well. Rozanes and Mia also include a find-it puzzle for readers to work through on their own. Tomorrow Is Near But Today Is Here: Anxiety, ADHD and Anger Managed through Mindfulness is most highly recommended. Tomorrow Is Near But Today Is Here: Anxiety, ADHD and Anger Managed through Mindfulness by Asaf Rozanes is a book written for kids but one that has a timely and relevant message that definitely adds value to the lives of mature readers. In this book the author crafts a story that will not only inspire young readers but teach them how to let go and embrace the magical beauty of the moment. Mia is a character that many children will identify with. The book helps children understand why they get anxious and worried, teaches them to focus on what matters and to understand what it is that matters --- lessons that older folk still struggle to learn. In this creative book, Asaf Rozanes uses the gift of communication to transmit a message that will transform lives. Mindfulness is taught in a style that is easy and very accessible, with stories and practical steps to learn to stay focused, to forget the past and find meaning and positive energy in the present moment. Tomorrow Is Near But Today Is Here: Anxiety, ADHD and Anger Managed through Mindfulness is written to be entertaining and inspiring at the same time. It's one of the rare books to gift children experiencing anxiety and, at this age, when children are beset by all sorts of psychological problems, this book comes along as a much-needed antidote for young souls. This book is a great achievement, a wonderful resource for kids and a learning tool that can help them shift perspective and find meaning in embracing the realities of the moment. So highly recommended!